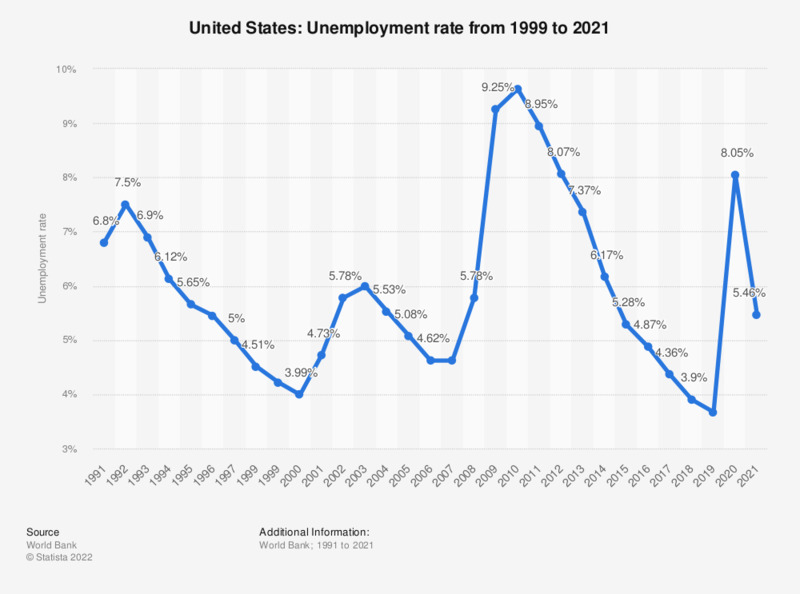 This statistic shows the unemployment rate in the United States from 2007 to 2017. In 2017, the unemployment rate among the United States population ranged at approximately 4.36 percent. The most notable surge in unemployment in the United States occurred between 2008 and 2009, and peaked in 2010. The United States was one of the countries most severely affected by the global financial crisis, primarily due to the crash originally materializing in the country. The crisis had a considerable effect on American households, most prominently on the labor market, which was also met with a significant decline in the stock market as well as the housing market. In order to stabilize and maintain a healthy economy, the United States government was inclined to absorb debt. The country’s national debt had increased yearly, however surged most remarkably in 2009 and has almost doubled in roughly 6 years since the crash. In order to determine if a country is able to pay back debt, the so-called debt-to-GDP ratio is used. It is often expressed as a percentage - the lower the percentage, the more likely a country can pay back debts without absorbing further debt. The United States’ debt-to-GDP ratio correspondingly began increasing in 2008, after experiencing an annual decline in the years prior, and is continuing to increase. Additionally, the United States maintained a budget deficit over the past decade, implying that its expenditures are higher than its revenues. This value has however significantly declined since 2009.